On the other hand, the Commanding General of troops has the exclusive duty of preparing and executing the major troop tactical plans for the operations on shore. The Commander Joint Expeditionary Force is concerned with the troop plan for shore operations only to the extent of such matters as offering technical advice concerning the provision of the naval and the initial air support, and of other important similar but contributory efforts. 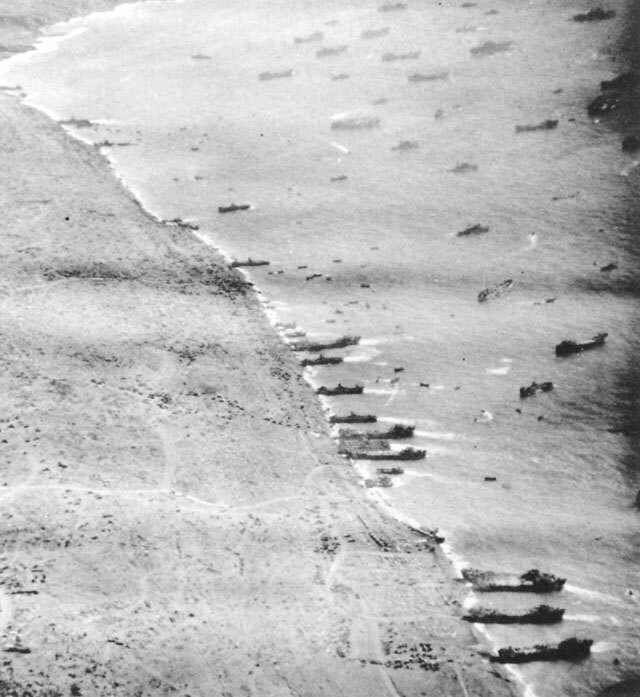 The successful discharge of both the naval responsibility for landing and supplying the troops, and also of the troop responsibility for land operations, often depends to a considerable extent on the choice of the landing beaches. The choice of the beaches is the business of both sea and land commanders. This matter requires close cooperation and a careful consideration of all alternative beaches, having due regard to the proper functions and military responsibilities of both parties. the Joint Chiefs' level to advance the date of the landings on Leyte Island in the Philippines from 20 December to 20 October 1944. Also cancelled out were the scheduled landings on Mindanao Island and the lesser part of the Central Pacific STALEMATE Operation against the Palau Islands, Yap, and Ulithi. To provide adequate forces for the Leyte operation, it was planned to place the Eastern Attack Force assigned to assault Yap and Ulithi in STALEMATE, and the Commander Third Amphibious Force, Vice Admiral T. S. Wilkinson, at the disposal of General MacArthur. The Western Attack Force in STALEMATE was called upon to provide from within its available resources a Regimental Combat Team to assault Ulithi. Vice Admiral Turner continued to plug for his officers. His success was minimal, but at least his subordinates knew he was trying hard to obtain recognition for them. The Amphibious Force suffered from the lack of 1st class officers. Many were 'fitted' instead of 'best fitted.' This sometimes affected their approach to the war. The personnel of the Navy were largely unprepared mentally for fighting, for killing people, for instantaneous decisions to take offensive action. Reifsnider and Kiland were the two best officers in the early days. Impossible to get Reifsnider promoted, as Admiral Turner repeatedly urged. After I left the Staff, Turner finally got him spotted to Commodore (April 1943) and then later he was selected to rear admiral. Linscott was a well rounded staff officer who knew the details of amphibious operations. He was very capable and devoted to his tasks. He had an encyclopedic mind, and was loyal to the hilt to Turner. Ghormley couldn't make up his mind and was full of 'qualifications.' Halsey always seemed to make up his mind quickly, except in the November 1942 period, when he backed into Indecision Corner. Browning, his Chief of Staff, was brilliant but erratic and given to flights from reality. The Gilberts, the Marshalls, and the Marianas amphibious operations brought to full fruition the steadily developing capability of the combatant Navy in the Pacific Ocean to pick its objectives quite free from the short leash of land-based fighter aircraft, whose cover was inherently modestly ranged. During the Marianas operation, the Fast Carrier Task Forces of the Pacific Fleet had beaten off the carrier air attacks of the whole Japanese Mobile Fleet and in all of the Pacific campaigns the heaviest air attacks of landbased fighters and bombers, which the Japanese had been able to mount against them. expertise, restored full confidence to the professional personnel of the seagoing Navy in the Pacific. Their confidence had been greatly shaken, first by the successful Japanese attack on Pearl Harbor, later by our short step by short step campaign up the Solomons and the even shorter steps of the campaign in the southwest Pacific, these steps being measured by the range of land-based fighter aircraft. The urge to keep moving pervaded the whole Pacific Fleet. The pressure to do so from on high was unrelenting: The big questions were "Where do we go next?" and "How soon?" At this stage of the war, July-August 1944, the planners were divided between (a) those who believed the Japanese war effort could be starved into innocuousness, thus forcing political submission without the necessity of waging large land battles on the Japanese home islands and (b) those who as loudly proclaimed that since all through the Central Pacific campaign the Japanese had fought on to the death under hopeless circumstances, a large-scale invasion of Japan would be essential to subdue the Japanese martial spirit. 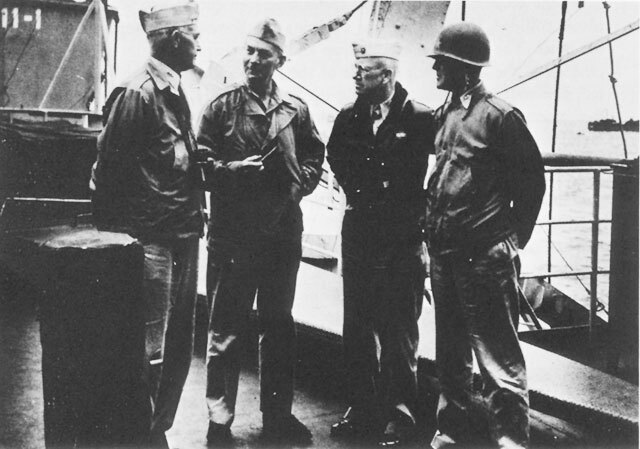 It is from this background that, in mid-June 1944, the Joint Chiefs asked General MacArthur and Admiral Nimitz to comment on the practicability of bypassing the then presently selected next major objective (Leyte in the Philippines on 15 November) and landing amphibious assault forces directly on either Formosa or on Japan proper. 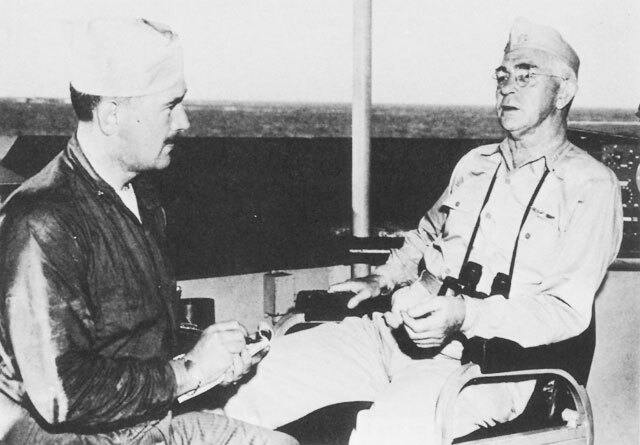 General MacArthur thought the proposal to bypass the Philippines and land on Formosa direct to be "unsound" and the proposal to bypass the Philippines and land on Japan "utterly unsound." Actually, the combination of Fleet bases most used during the last part of 1944 turned out to be Guam, Saipan, and Ulithi Atoll, which was 400 miles southwest of Guam, while Eniwetok was 1,000 miles just a bit south of east of Guam. Ulithi Atoll, with a lagoon of about 150 square miles, was an exceptionally fine Fleet Anchorage and by early 1945 became a well developed Mobile Fleet Base. By and large, in mid-July 1944, Vice Admiral Turner favored taking Luzon in order to obtain Fleet bases there before going to either China or Formosa. He so informed Admiral King, when the latter was in Pearl Harbor at this time and his beliefs became a matter of record.13 The seizure of Formosa, largely, was Admiral King's baby. This included not only the island, but the Pescadores in Formosa Straits and a bite of the adjacent China Coast--probably at Amoy. Admiral King believed that all sea and air lines of communication from Japan south could be effectively throttled by holding the Marianas, Formosa, and a strategic foothold on the China Coast. All Pacific Fleet planners agreed that Japan could not long live, much less aggressively fight a war, without overseas oil, raw materials and food from the Netherlands East Indies and Malaysia. How to best accomplish this objective of cutting off Japan from her overseas resources, however, was the bone of contention causing the strongest arguments. Despite the compelling nature of General MacArthur's advocacy, the shoal which finally scuttled "full steam ahead for Formosa now" at the Washington JCS and departmental level, in early September 1944, was the shortage of troops currently in the Pacific Ocean Area or to become available by late December 1944. The Normandy landing in June 1944, had gone well, but in early September 1944, no one could reasonably predict when the tremendous troop resources then in Europe would become available to move to the Pacific. before the month of October 1944 was three days old, however, as will be related, General MacArthur had carried the day. His "strongest nonconcurrence with any other objective than Luzon in the Philippines was powerful medicine in any military planning circle's coffee break. Who Gets What Naval Forces When? As matters actually transpired, the high level planners' struggles to allocate simultaneously a suitable proportion of naval forces, shipping and logistic support to both the Atlantic and Pacific theaters of operation eased off about the time Guam was recaptured and the invasion of Southern France was made on 15 August 1944. But the planners' travail over the allocation of naval forces in the Pacific between the effort under Admiral Nimitz' s direction and that under General MacArthur's direction went on and on through late 1944 into 1945. When FORAGER was over and done, Formosa was very much on CINCPOA' s officially approved timetable issued to him by the Joint Chiefs. This conclusion fitted neatly into the "Luzon Homecoming" plans being formulated by General MacArthur in far away New Guinea, as well as the speed-up in our initial landing in the Central Philippines, so recently recommended by Admiral Halsey. The planned amphibious assaults on Peleliu in the Western Caroline Islands, Yap in the northwestern Caroline Islands, Ulithi in the northwestern Caroline Islands, and Mindanao in the Southern Philippines be cancelled. The troops and amphibious resources assigned to these operations, and Task Force 38 (the Fast Carrier Task Forces of the Pacific Fleet) should be used for an amphibious assault at Leyte in the Philippines earlier than the 15 November, currently planned. Subject to the two modifications, one major and one minor, proposed by Admiral Nimitz, the Joint Chiefs then approved Admiral Halsey's proposal and the proposed date for the Leyte landing. When these changes were made, the question of "where next" after Leyte had not been settled, but all the important voices, except Admiral King's, were opting for Luzon. Okinawa. Okinawa was centrally located between Kyushu, the big southern island of Japan, and Formosa, and could also receive support from Japanese forces in Eastern China and, until Iwo Jima was in our hands, that latter island also. By capturing Iwo Jima first, we would knock out one of the four strong props holding an air umbrella over Okinawa and its approaches. Besides, the date when airbases in northern Luzon, helpful in an assault on Okinawa, would be available, was still problematical, despite General MacArthur's promise of a thirty-day to six-week campaign. Doing Iwo Jima first would make the availability of the northern Luzon bases for air support of the operation against Okinawa seem a bit more logical. 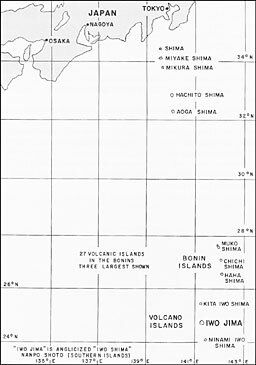 Since the JCS did not issue their new Pacific campaign directive embodying Admiral King's change in mind until 3 October, it was not until 7 October 1944 that CINCPOA issued his staff study for the operation which envisioned a landing on 20 January 1945 at Iwo Jima in the Volcano islands, 660 miles south of Tokyo. The Iwo Jima campaign was given the code name of DETACHMENT. Many of the lower level in the Pacific Fleet thought the code name selected indicated that one of the pillars supporting the roof of air protection over Okinawa was to be detached. It was a pleasant thought for those who later were scheduled also to participate in the Okinawa operation. 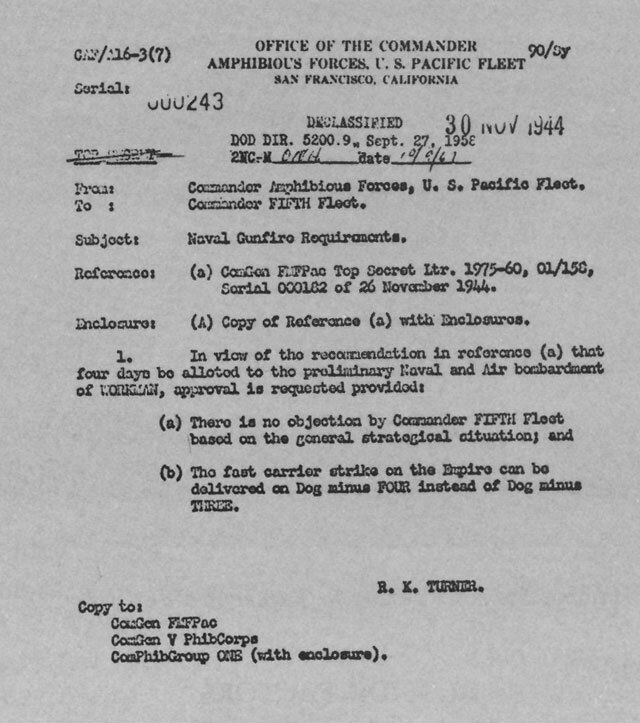 Only nine days after 7 October, Vice Admiral Turner issued a guideline memorandum to his staff for preparing the operation plan for the amphibious phases of DETACHMENT. By the time the Marianas Campaign was completed, the Special Planning Staff assigned to FIFTHPHIBFOR in November 1943 had been disbanded. This Staff had been formed in November, 1943, with high hopes. It was assigned the mission of doing, in Pearl, the advance planning for the next ahead amphibious operation, while the regular FIFTHPHIBFOR Staff at the scene of the assault landing was devoting all its time and energy to obtaining success in the current amphibious operation. The creation of this small special staff, it was hoped, would materially shorten the spacing between the completion of one amphibious campaign and the launching of another, by a reduction in "planning time." The problem of close air support had bothered Vice Admiral Turner all through the Guadalcanal, New Georgia, Gilbert Islands, and Marshall Islands Campaigns. As has been related earlier, Commander, Fifth Amphibious Force had tried in January 1944, to establish "Support Aircraft" as an administrative unit, as well as a task group, within the Fifth Amphibious Force. This effort had failed and "Support Aircraft" remained under the administrative command of Commander Air Force, Pacific Fleet, Vice Admiral J. H. Towers. The administrative commander was responsible for its training. Twenty-seven officers and 60 enlisted men were involved in the administrative unit. had reopened with the Commander in Chief, U.S. Pacific Fleet, the touchy question of the organization of the Support Aircraft Command. Vice Admiral Turner recalled in the first paragraph of his letter that he had been directed on 18 April 1944 not to reopen the subject "unless actual experience under approved arrangements indicates further change is necessary." In his letter, he stated that that time had now come, since the present system lacked efficiency and had not proven satisfactory. the amount of training so far given by the Air Force Pacific Fleet to Support Command is nil. . . . Apparently it still is not well understood that all of the units directly and locally involved in an amphibious operation must be so closely related to each other as to form a single team under a single control. . . . Furthermore, the planning functions must be so arranged that all individual plans are fully correlated by one command. It would have been diplomatic to have waited until after the experience of FORAGER had been gained to renew this close air support command proposal since COMINCH's and CINCPAC's directions were only two months old, but such was not the procedure followed by Vice Admiral Turner. His proposal had been strongly opposed by many of the senior aviators of the Navy who were reluctant to grant control of naval air operations to non-aviation commands regardless of circumstances. This opposition extended to the amphibious forces, even though its Commander, Vice Admiral Turner, was a former naval aviator. Reconsideration and finally approval of the Support Aircraft Command proposal made by Vice Admiral Turner was granted by Admiral King on 1 October 1944. This was in time for the planning to go forward on the new basis for the Iwo Jima operation. On 1 August 1944, the Seventh Amphibious Force, with two Amphibious Groups assigned, was established under Commander Seventh Fleet in the Southwest Pacific Area. Rear Admiral Dan E. Barbey was designated the Commander, Seventh Amphibious Force, and in December 1944 advanced to Vice Admiral. On 24 August 1944, COMPHIBPAC requested that a staff complement of 85 officers and a staff allowance of 194 enlisted personnel be authorized for his command.30 When approved, this was the final enlargement of the staff. In terms of officers it was five times as large as the staff Rear Admiral Turner had started with at Guadalcanal. At Iwo Jima and for the first time in the Central Pacific Ocean amphibious operations, all immediately pre-D-Day amphibious operations at the objective were coordinated under the control of a newly designated Commander Amphibious Support Force. Rear Admiral W. H. P. Blandy, was named to command this Force. Its tasks included the close-in gun bombardment by landing craft, gunboats, mortar and rocket craft, the minesweeping, the work of the underwater demolition teams, air control in the objective area, the air support, and commencing on Dog Day minus three, the gunfire support. USS Eldorado (AGC-11), Vice Admiral Turner's flagship at the Iwo Jima invasion. to designate either Rear Admiral Harry W. Hill or Rear Admiral W.H.P. 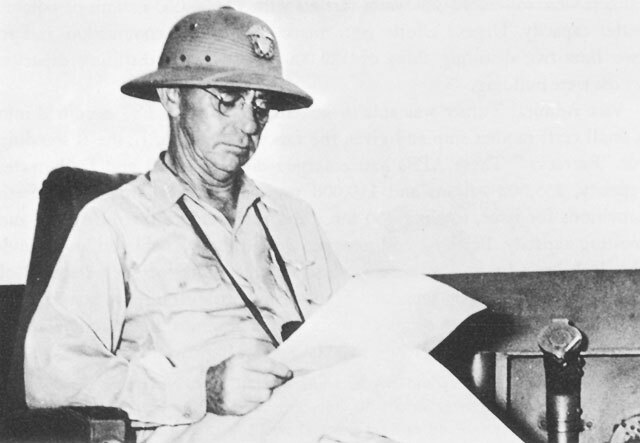 Blandy as Second-in-Command of the Amphibious Forces at Iwo Jima or at Okinawa. Rear Admiral Hill, the senior, was so designated. On 27 December 1944, loading for DETACHMENT commenced. On 10 January 1945, Vice Admiral Turner shifted his flag to the Eldorado, a newer amphibious command ship than his former flagship. 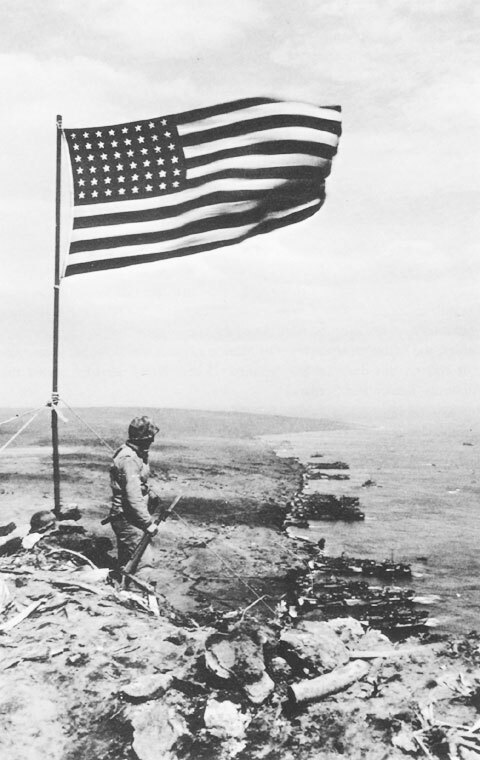 Iwo Jima was only one of a considerable number of Japanese islands in the chain of islands stretching from the Empire to the northern Marianas. The Japanese called this chain of islands Nanpo Shoto. Located therein were three groups of which the two best known are the Bonin and the Volcano Islands. Vice Admiral Turner dictating to his writer enroute to Iwo Jima, 1945. On 20 June 1944, an outline plan to assault and seize Chichi Jima, as the final phase of a 13-day operation involving air strikes against Luzon, Formosa and Mainland Japan, was formulated and submitted to Admiral King. The code name of the plan was FARRAGUT, a weighty name for any bold naval operation. 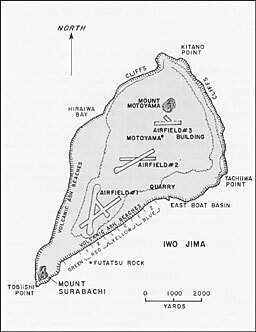 While Chichi Jima, 146 miles north of Iwo Jima, had a good harbor--plus an advanced naval base, which Iwo Jima did not have--Chichi Jima was very, very rugged, and its one airfield was judged unsuitable to accommodate B-29s. Iwo Jima, also known as Sulphur Island, is the largest of the Volcano Islands. It lies about equidistant in the 1,262 nautical miles between Yokohama, which is the port of Tokyo, and Saipan. This volcanic and pear-shaped island, four and a half miles long and eight hundred yards to nearly two and a half miles wide, lies with its stem axis--southwest to northeast--right into the northeast trade winds. The amphibians were glad to learn that there was no barrier reef on the eastern side of the island, and that the one on the western side was not formidable. Mount Suribachi, an extinct volcano 546 feet high, rises from the narrow neck of the pear at the southwesterly end of the island. Mount Motoyama, still jetting steam sulphur fumes in 1945, rises about 350 feet high in the bulge of the pear on the northern westerly part. The northern half of the island was largely a rocky and highly irregular plateau rising to three hundred feet above sea level and centered on Mount Motoyama. In this part there were steep cliffs protecting the island from sea assault and a series of canyons and caves providing strong natural defensive positions. There also was a sulphur mine and its refinery, a small sugar mill and minuscule farms which had absorbed the peacetime working endeavors of the civilian population on Iwo Jima. One completed airfield and one airfield under construction absorbed most of the level ground on the northern plateau. These airfields were known as Airfields No. 2 and No. 3.
the built-up and graded positions of the airfield in the southern midsection of the island, known as Airfield No. 1. All areas of Iwo Jima were within easy range of naval gunfire, but required air spot because of the elevation above sea level. The northern half of the island presented a difficult gunnery problem due to its irregularity. In general, the Pacific Ocean around Iwo Jima does not match the flat calm seas experienced by sailormen in the Central Pacific. The wind blows stronger, and from November to March, generally from the northwest. During the cool season, from December through April, temperatures are comfortable, 63° to 70° F, with three and a half to five inches of rain each month, mostly in drizzles of long duration. February normally is the driest month of the year with 3.5 inches of rainfall. Tides at Iwo Jima are two to three feet and tidal currents are not strong, except close to the beach where there is a strong undertow. Perhaps best of all, from the Marines' viewpoint, Iwo had no mosquitoes. tankers were converted into water carriers with 42,000,000 gallons of potable water capacity. Urgent efforts were made to get into commission and to Iwo Jima two distilling ships of 120,000 gallons daily distilling capacity, which were building. The northwest seas and winds, which prevail from November through March will interfere at times with unloading on northwest beaches. Likewise prevalence of south and easterly seas and swells from April to October will preclude uninterrupted use of the excellent beaches on the southeast coast, and may interfere with the considered construction of an artificial harbor in this sector. These difficulties, together with the fact that there is no well protected harbour or anchorage on any coast, will add greatly to the unloading problem. . . . The forecast would have been more nearly correct had he placed a period after "times". In October 1944, CINCPAC had estimated that there were 13,000 Japanese troops on Iwo. CINCPAC also estimated the three Japanese airfields on Iwo Jima would be captured by Dog Day plus ten. Both estimates were on the optimistic side, but the latter was reasonably close. Vice Admiral Turner, Commander Joint Expeditionary Force (TF 51), studies staff memorandum enroute to the assault on Iwo Jima. Immediately after the invasion of Saipan in mid-June 1944, the Japanese inaugurated a major crash effort to build up Iwo Jima defensively, as well as other islands in the Nanpo Shoto chain. 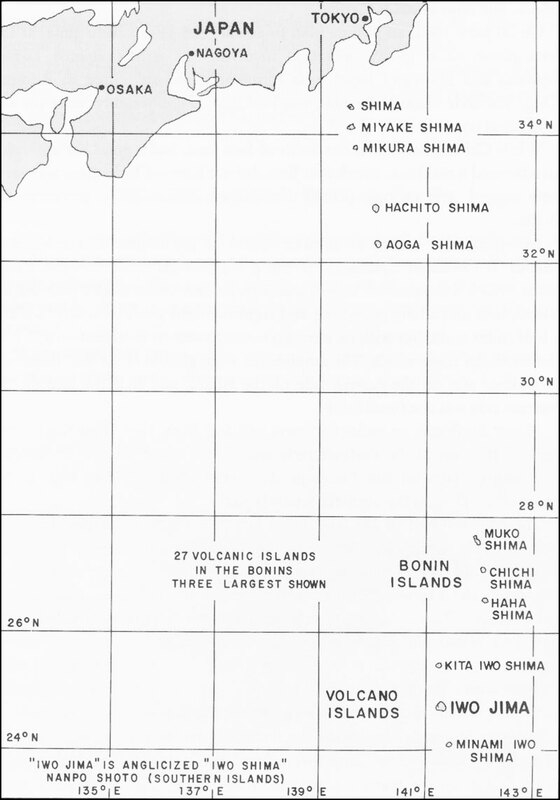 the top command organization of the 31st Japanese Army to which the Bonin-Volcano Islands had been assigned. A new commander, Lieutenant General Tadamichi Kuribayashi, was ordered and the 109th Division was moved to the defense of the Volcano-Bonin Islands. The naval forces on Iwo Jima, consisting of the 27th Air Flotilla, the Naval Guard Force manning the coast defense and anti-aircraft batteries, and a Naval Construction Battalion, were commanded by Rear Admiral Toshinosuke Ichimaru, a naval aviator. More than three-quarters of the defending anti-aircraft guns were naval. The Island is garrisoned with a balanced organization of Army and Navy troops and construction personnel, the total numbering between 13,000 and 14,000. Approximately 1,050 civilians live on the island. Adequate supplies are believed to be on hand for the garrison. This was in error because all the civilians had been evacuated. Total defenders, including Koreans and natives of Iwo in the construction battalion, reportedly numbered over 20,000.41 Exact numbers are not available from Japanese records, because of the loss of Japanese military personnel and their records enroute to the island, thanks to our submarines. from the beaches. Mutually supporting defensive positions were built on Mount Suribachi and on the Motoyama Plateau. Guns, rockets, and mortars of all types and sizes were placed therein. A few of the 24 tanks were so located on the Motoyama Plateau as to provide a spearhead for local counterattacks. A good many of their guns were found dug in at the entrances to caves. The Japanese backed up their defensive positions with an elaborate system of interconnecting tunnels. Great effort was made, and considerable success obtained, by the Japanese in their desire to camouflage or conceal their defensive positions. We must inculcate a spirit that will not stop short of victory, maintaining a faith in self-sacrifice for the common cause, and determining to work with burning eagerness and high morale for the strengthening of mind and body, the perfection of military skill and training, and the increase of military preparation. The same enthusiastic thoughts were expressed in the diary of a second lieutenant serving on Iwo Jima. The Japanese had learned that they could not hold open beaches against naval gunfire, but they planned to make it very expensive in men and material to land on these beaches or to move off of them. Of prime interest to the gunners of the Expeditionary Force, by the time the delays taking place in the operations in the Philippines had ended and the Iwo Jima operation could proceed, the Japanese had markedly increased their defensive guns and mortars on Iwo Jima. Pearl Harbor area provided, respectively, reconnaissance coupled with air-sea rescue and broad logistic support. The Commanding General, 20th Air Force provided general support by air bombing on Japan proper. The Commanding General, Southwest Pacific Force, provided long-range reconnaissance over the Western Pacific from Leyte and Mindoro in the Philippines as air bases there became available for this purpose. The Special Groups were a new organization in our amphibious operation plans although their tasks were not new. Each group performed an essential, if minor, support task for the might Fifth Fleet, as the titles indicate. naval reconnaissance aircraft, either seaplanes or amphibian planes, together with their supporting tenders. The Logistic Support Group of about fifty ships which included six jeep carriers, along with oilers, ammunition, store and refrigeration ships, and a protective anti-submarine screen was ordered to provide replacement aircraft and aircraft crews as well as essential supply items. Service Squadron Ten contained over 260 ships and craft and included repair ships, destroyer tenders, fresh water carriers, and miscellaneous service ships to handle emergency repairs as well as battle damage and seaborne hospitalization. For DETACHMENT, 495 ships were attached to TF 51 and employed by Commander, Expeditionary Force, in the initial assault and the First Garrison Echelon. There were 75,144 Army, Navy, and Marine personnel in the Landing Force, with 70,647 being Marines. Without naming or listing all the ships and craft in this massive Expeditionary Force, it seems worth summarizing that there were 43 attack transports, 16 attack cargo ships, 63 LSTs, and 58 LCIs besides 18 of the LCI gunboats, now designated LCS. 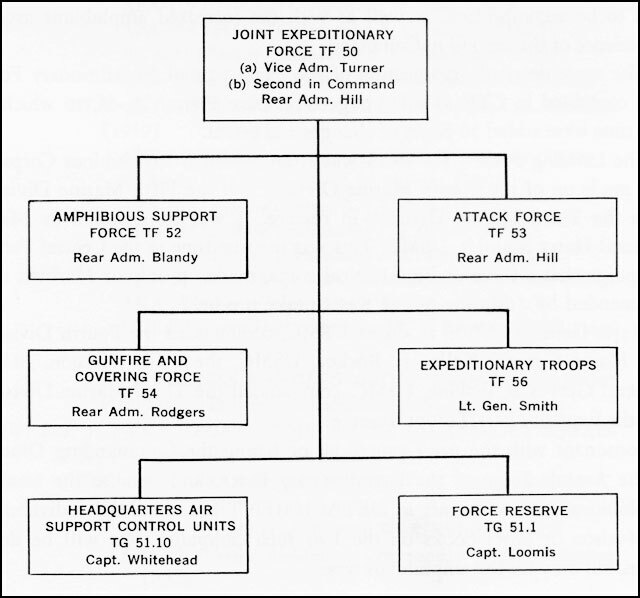 The new organizational features of the Expeditionary Force were two. The most important was the gathering into one task group of all the ships which were to furnish, in the immediate period before Dog Day: (a) pinpoint air, gun and mortar bombardment: (b) minesweeping, netting and buoying; and (c) beach reconnaissance and its attendant underwater demolition. This group was designated Task Force 52, the Amphibious Support Force. Rear Admiral W.H.P. Blandy was given this command. The Amphibious Support Force included an Air Support Group with eight jeep carriers, an Air Support Control Unit, and Underwater Demolition Group and a Gunboat Mortar Support Group with rocket LCIs and gun LCI units. To permit him to accomplish his heavy gun bombardment task, CTF 52 was authorized to draw on an offensive Gunfire and Covering Force (Task Force 54) of six battleships, five cruisers and their anti-submarine screens. Rear Admiral Bertram J. Rodgers commanded Task Force 54. As will be noted from the diagram on page 997, Vice Admiral Turner turned over the command of the actual amphibious assault, lock, stock and barrel, to his designated Second-in-Command, Rear Admiral Harry W. Hill. This was consonant with the increased magnitude of the overall amphibious task to be accomplished, as well as with the increased amphibious assault experience of the Second-in-Command. 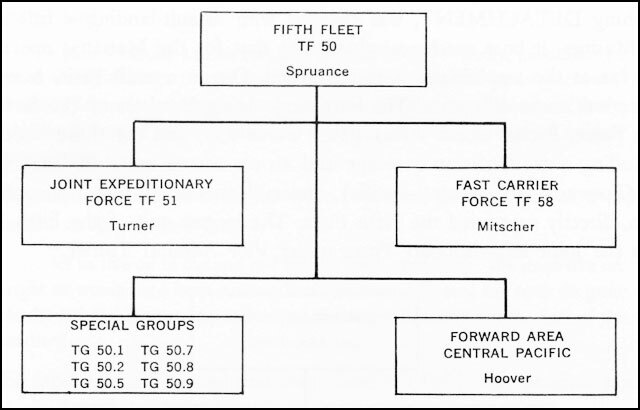 The more detailed organization of the naval part of Expeditionary Force was contained in CTF 51's 435-page Operation Plan A25-44, to which in due time were added 50 pages of changes and errata. The Landing Force (TG 56.1) was from the Fifth Amphibious Corps. It was made up of the Fourth Marine Division and the Fifth Marine Division with the Third Marine Division in reserve. It was commanded by Major General Harry Schmidt, USMC. This was the first time in the Central Pacific campaign that a three division tactical corps, made up only of Marines, and commanded by a Marine officer was to take the field. Major General Clifton b. Cates, USMC, commanded the Fourth Division and Major General Keller E. Rockey, USMC, the Fifth Division. Major General Graves B. Erskine, USMC, commanded the Third Marine Division and the Expeditionary Troops Reserve. Consonant with the prior procedure of listing the Commanding Officers in the Assault Force of the expeditionary Force, and because the smaller amphibious ships and craft in DETACHMENT are not listed individually in Morison or other books on the Iwo Jima campaign, this will be done again, but only for the amphibious types. Thirty-one LSTs carried LCTs but only the LCTs listed above were to be launched at the objective, as ordered by Command Attack Force. Old Task Force 62 which sailed so proudly forth to assault Guadalcanal on 7 August 1942, numbered 51 ships. Task Force 51 numbered 495 ships--ten times as large. The call on the amphibious resources of the Pacific Fleet had just barely been met by using for assault operations every new amphibious ship as it rolled down the production line, slid into the water, and steamed towards the mid-Pacific. Amphibious ships and their landing craft could be built faster than the officers and seamen to man them and their landing craft could be trained to do their difficult tasks. There was no lack of desire to do the correct thing at the correct time in the correct manner. There was only a lack of acquired skill. The problem of untried personnel was mentioned by many. The Scheme of Maneuver called for landing two divisions abreast on the southeastern beaches of Iwo Jima, the Fourth Marine Division on the right, and the Fifth Marine Division on the left. The Fifth Marine Division was to drive across the island and then swing to the northeast. At this same time, a Regimental Combat Team of this division was to swing left and take Mount Suribachi. The right flank of the Fourth Division was to wheel to the right and head for the Quarry and East Boat Basin while the rest of the Fourth Division was to push in towards the center of the island, overrun the main airfield [Airfield No. 1], and then to wheel to the northeast and head for Motoyama Plateau and Airfield No. 2, located thereon. The Third Marine Division, when and as released by the Expeditionary Troop Commander, would land over the same southeastern beaches either to assist in the attack or to occupy defensive positions. islands. The preliminary rehearsals, including actual landings on designated days and then simulated landings with actual gunfire and air support on other days, were held in Lahaina Roads from 11 to 18 January 1945. Due to the operational requirements of the Luzon landings of the Philippine campaign commencing 9 January 1945, most of the designated naval gunfire ships and air support units could not participate in the Lahaina Roads rehearsal. thought the rehearsals in the Hawaiian Area: "were well executed," and that the absence of the naval gunfire ships and air support units "was overcome to some extent by a short rehearsal in the forward area." At a much lower level, the rehearsal was appreciated greatly. That the Hawaiian rehearsal was reasonably realistic and much needed by the naval part of the amphibious team is attested by recording that eleven ships and craft collided or stranded during the rehearsal. 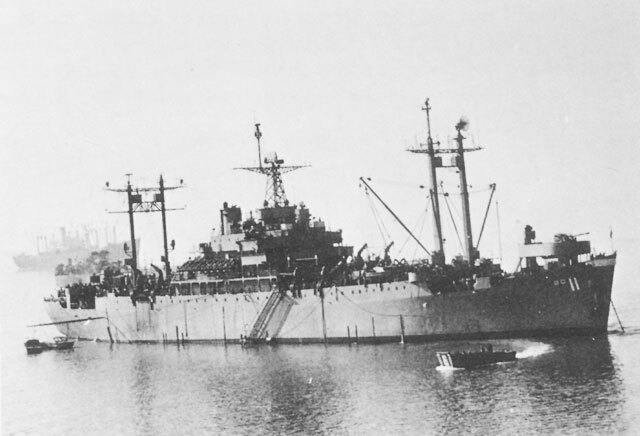 Luckily only one, the LST-1031, which was beached, badly damaged, required replacement prior to movement to the Far Pacific. During the Marianas rehearsal, the ocean was more than just a bit rough. One destroyer, the Halford (DD-480), was damaged and had to be returned to Pearl Harbor for repairs. Six amtracs were swamped and lost, and twelve LSTs suffered minor hull damage. Not all scheduled operations were carried out, particularly on 12 February 1945. Vice Admiral Turner missed the rehearsals in Lahaina Roads due to a virus and the designated Second-in-Command, Rear Admiral Harry W. Hill, conducted them. The latter in his Action Report, labeled it "a very useful rehearsal." my last talk with him, the day before our departure for Iwo, he was in bed with extremely high fever with a threat of pneumonia. I had never seen him so ill, and was deeply concerned. I begged him to take it easy and carry out the doctor's orders. . . . The Secretary of the Navy, James Forrestal, had arrived aboard the flagship Eldorado to ride to Iwo Jima with Vice Admiral Turner, and this perhaps increased the speed of his recovery. The designated beaches on the southeast shore of Iwo Jima covered 3,500 yards, and the two divisions abreast were to be landed on 3,000 yards of these beaches. There were seven beaches, each about five hundred yards wide from north to south along the southeast coast of Iwo Jima. They were designated from north to south Blue 2, Blue 1, Yellow 2, Yellow 1, Red 2, Red 1, and Green 1. It was planned to use all the designated beaches in the initial assault, except Blue 2, the right hand beach, which was too close to the Japanese quarry for comfort. 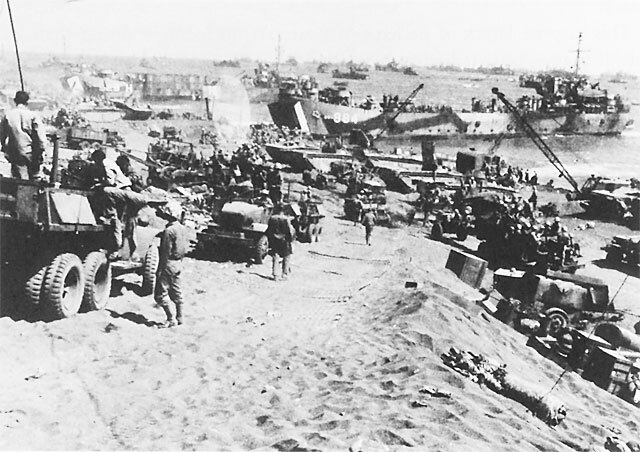 The eight battalion landing teams, including one in immediate back-up position for Green Beach One and the other in back-up on Blue Beach One, were embarked in 28 LSTs. They were to be landed in amtracs, preceded by the LVT(A)'s, the amphibious tanks. The reserve battalions for the Blue, Yellow, and Red beaches were to be embarked in LCVP's and LCMs in Rendezvous Area near the Transport Area, ready to be called up and landed when needed. LSMs carrying tanks and half-tracks, and the LSTs carrying the divisional artillery, were to be stationed between the Transport Area and the Line of Departure, ready to send their weapons ashore as needed and called for by the Marines. 40-millimeter and 20-millimeter armament were to precede the assault waves by 600 yards as they moved toward the beaches. About ten minutes before touchdown of the lead wave, the rocket gunboats were to fire an initial salvo of rockets, and between that moment and six minutes before the lead wave arrived at the beach, a second salvo. Twenty-millimeter and forty-millimeter guns were to be used freely to suppress any Japanese return fire. A 30-minute run from the Line of Departure to the beach was anticipated at the predicated amtrac speed of four knots. Twice during the immediate pre-assault period, gunfire was to lift, and air strikes on the beach area were to take place. The lifting of the gunfire and the laying down of the air strikes was to be closely coordinated to prevent the long hiatus which had occurred at Tarawa. By the time the actual landing was made, the firing ships available in the assault areas had their target areas redesignated, and the firing on the beach areas was considerably beefed up. This resulted in the heaviest pre-How Hour bombardment of the Pacific campaign. Four battleships, four cruisers, and eight destroyers fired on the east coast beaches and provided a modified rolling barrage, well controlled ahead of the Marines. In addition, one battleship and one heavy cruiser gave their exclusive attention to Mount Suribachi. Sixty-eight LVT(A)'s were in the lead wave, and 83 LVTs in Wave 2 with varying lesser number of craft in Waves 3 through Wave 5. Wave 6 on Green and Red beaches contained LCMs and LCVP's. Wave 6A consisted of LCT' s and LSMs carrying tanks. Altogether 482 amtracs were to participate in the assault. A possible unwanted dividend from the mine-laying occurred later when one of our destroyers, the David W. Taylor (DD-551), struck a mine on 5 January 1945, about 7,000 yards off the harbor of Chichi Jima and well outside of the area our planes had presumably mined. Many of the preinvasion bombardments of Iwo Jima were coordinated surface ship and air bombardments. Planes of the Strategic Air Force undertook to spot for the ships during some of the bombardments because there was no fighter cover for the cruiser spotting planes. Accuracy of spotting by these aircraft from the Strategic Air Force was varied since this was a new mission for the B-24s. Communications were difficult or impossible to establish, and the aircraft were tardy to very tardy in making their rendezvous. The first large-scale gun bombardment of Iwo Jima took place on 11-12 November 1944, and subsequent surface ship gun bombardments occurred on 8, 24, and 27 December 1944, as well as 5 January and 24 January 1945. Most of these bombardments were conducted by Commander Cruiser Division Five (CTG 94.9), Rear Admiral Allen E. Smith, Commander. Secretary of the Navy James Forrestal confers with assault commanders in USS Rocky Mount off Iwo Jima, 22 February 1945. Left to right: Vice Admiral Turner, Secretary Forrestal, Lieutenant General Holland M. Smith, and Rear Admiral Harry Hill. Cruiser Division Five and Destroyer Squadron Four returned to their target again on 24 and 27 December 1944, and again their operations were coordinated with an air strafing and air bombardment attack. Spotting reportedly was greatly improved since the same plane crews and spotters were available as used in the 8 December operation. However, the Japanese coastal defense batteries were positioned on elevated land, 150 feet to 250 feet above sea level and thoroughly revetted. This made the gunnery bombardment problem difficult, when not impossible. No exaggerated claims were made for any of the surface gun bombardments by the surface ship elements. Commander Cruiser Division Five in answering the question "Did it Pay?" said: "The answer is a qualified 'yes.'" Although spotting was excellent and bombardment was generally in areas assigned, there is no appreciable evidence of damage to shore installations. The raid . . . did not pay off as well as expected. 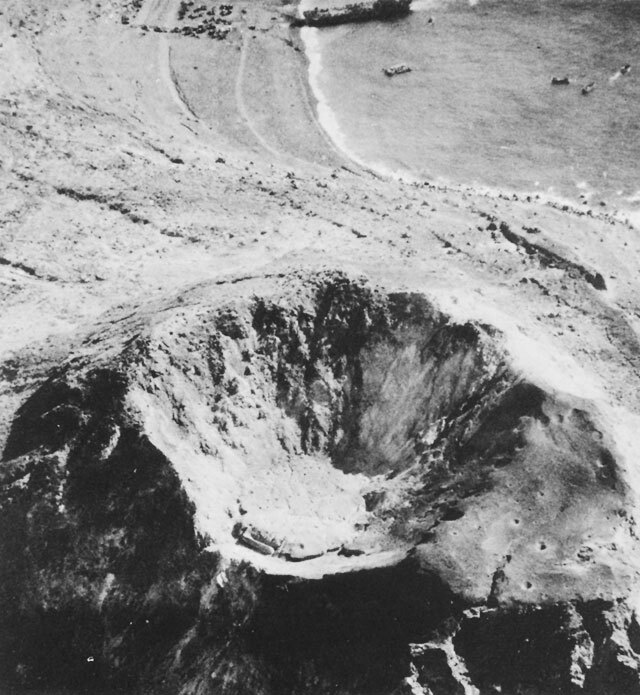 Five surface bombardments have not prevented the enemy use of Iwo Jima [airfields]. The purpose of this rather lengthy discussion of the pre-landing period surface bombardments and their coordination with B-24 air bombardments is to show that a real area bombardment effort was made to prepare Iwo Jima for the planned pinpoint air and gun bombardment by TF 52 and TF 54 of the Expeditionary Force. Despite this effort, there was a general lack of enthusiasm for the pre-landing surface bombardment results achieved from November 1944 through January 1945. This general lack of enthusiasm for the results achieved turned out to be really bad news for the assaulting Marines. An ever increasing number of Japanese defensive gun positions continued to be disclosed by the almost continuous photographic missions that were being flown. And many, many more well camouflaged gun positions and fortified caves and tunnels were not known to exist until the enemy's hand was forced just prior to, or subsequent to, the actual landing. Some nine hundred ships and craft were assigned to DETACHMENT. Because of operational requirements, part of which were due to supporting General MacArthur's Philippine operations, some of these had to be initially assembled at Eniwetok, Ulithi or the Marianas. Their coordinated movement to and closely timed arrival at the very cramped Iwo Jima beach area was a major task, calling for navigation, seamanship and seagoing judgment of a very high order. 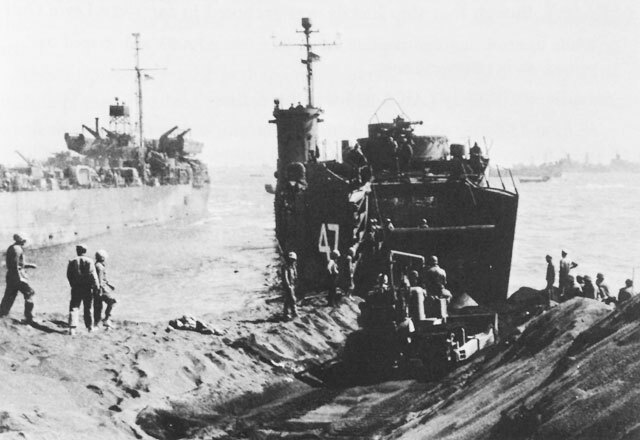 The movement of the Expeditionary Force towards Iwo Jima commenced when the Tractor Group of LSTs departed Pearl Harbor on 22 January, almost a month before the assault landing. The Transport Groups departed on 28 January. Movement of the ships and aircraft from the Hawaiian Islands was via Eniwetok for logistics support for the smaller craft, and then via Saipan-Tinian for the final rehearsal. No Japanese contacts were logged by the main body until in the vicinity of Iwo Jima, when, on 15, 16, and 17 February, possible submarine contacts were made. There was no surprise, either tactical or strategical, at Iwo Jima. The senior Japanese prisoner captured on Iwo reported that all troops had been moved into their defensive position on 14 February upon detection of Task Force 58 initiating its raids on Tokyo. 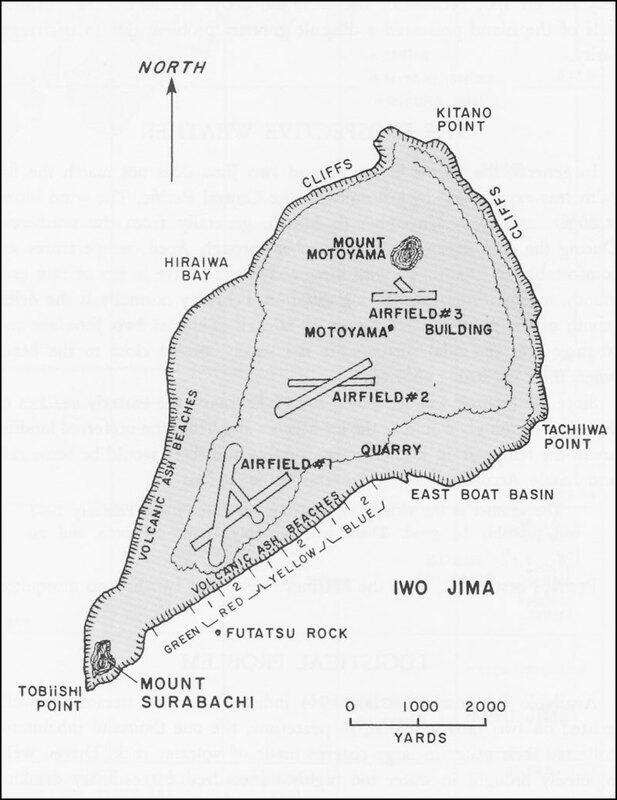 Strategically, the Japanese knew that we needed an island close enough to Japan to provide fighter protection for the B-29s, and that that island had to have adequate level terrain for two or three long airstrips. If that island had suitable beaches to accommodate a large amphibious assault, it was a likely objective. Iwo Jima filled this prescription closely. No other island in the southern part of the Nampo Shoto chain of islands quite did. Tactically, the Japanese submarines and air patrols provided the direction of our thrust, north along the Marianas chain. So the enemy knew it had to be Iwo Jima. A very generous amount of air bombardment by planes of both Services took place throughout the months prior to the landing and in the immediate pre-landing period. The great majority of the weight of bombs dropped prior to 16 February 1945, was high-level area bombardment by B-24s and B-29s flying out of the Marianas. Once the Japanese had started moving their gun and mortar installations into concrete-lined caves, narrow ravines, tortured gullies and cement-covered emplacements, the actual damage to guns and mortars was very limited. Sorties for the day totalled 158, but due to weather only 6 support missions were executed. . . . The afternoon Army Air Force heavy bomber strike arrived on station slightly ahead of schedule. The ceiling was too low for bombing, but as the weather was expected to improve, the Army bombers were kept on station for one hour, the maximum their fuel would allow. The weather did not improve and the strike was returned to base. Light antiaircraft was intense throughout the day. Heavy antiaircraft was intense only during the strike on the southern part of the island by 42 Army Liberators. . . . The majority of bombs dropped from 5000 feet hit in the target area. . . . Photographs showed no known installations hit by these bombs, but the fragments may have caused some damage and casualties. The effect of heavy bombardment aircraft over a lengthy period of time does not appear to have caused appreciable destruction of specific installations. It did not disrupt communications nor reduce morale of the enemy. Mount Suribachi with landing beach in background. Targets were well concealed and extremely difficult to locate. In spite of heavy bombardment of the objective, little damage was apparent. Only about half the bombardment contemplated on this day was accomplished. The weather cleared on Dog minus two and was suitable for air operations throughout the day. The minesweepers had located only one shaggy mine in eight feet of water and destroyed it. For the second day, the gunfire bombardment ships were ordered to carry out their pinpoint destruction of targets while in the 3,000 to 6, 000 yard gun range and to provide close support for the underwater demolition teams which were to begin their efforts at 1100. As the heavy ships worked their way inshore during the morning, the Japanese were gradually enticed to open up from a few well-concealed batteries and heavy mortars. The cruiser Pensacola (CA-24) was hit hard and the Tennessee (BB-43) lightly so. The Executive Officer of the Pensacola was killed and her CIC wrecked. When at 1100 the LCI gunboats moved in to provide close support for the personnel of the Underwater Demolition Teams, three previously unlocated guns in a four-gun Japanese battery overlooking the beach from Mount Suribachi, as well as a considerable number of untouched mortars on the high ground on the north flank of the beaches, came to life just after the gunboats let go their rockets. In the furious engagement that ensued eleven of the twelve of the LCI's were hit and one was sunk. The LCI's gallantly carried out their mission despite 170 casualties, and a relief craft took over the task of the LCI sunk. The close, close-in battleship Nevada (OBB-36) opened up with all her batteries on the multiplicity of targets. The Japanese batteries and mortars eventually checked or ceased their fire or were destroyed. Smoke rising from aerial and naval bombardment of Mount Suribachi. The LCI-348 was the only LCI of the initial twelve used for gunfire support which was not hit. 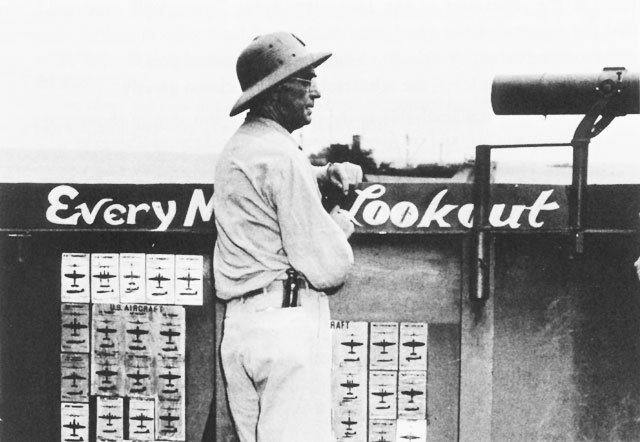 During these first two days prior to the assault landing, the water off Iwo Jima had been swept for mines, the beaches had been examined for underwater defenses by the Underwater Demolition Teams, and the island defenses had been peered at through hundreds of gun sights, spyglasses, binoculars and photographic lenses. Two pieces of early news were good. The Japanese had laid no mine fields around Iwo Jima and there were no underwater obstacles in the beach approaches. Surf and beach conditions were judged suitable for the assault landing. But, and it was a big but, the volume of enemy fire which the LCI gunboats had received while providing protection to the personnel of the Underwater Demolition Teams indicated that Japanese gun defenses of the beach area were still strong and effective. Though weather has not permitted complete expenditure of entire ammunition allowance and more installations can be found and destroyed, I believe landing can be accomplished tomorrow as scheduled, if necessary. Vice Admiral Turner, churning north in the Eldorado through a relatively calm sea and being advised that the weather on 20 February would not be so good as that on 19 February, made the final decision to land as scheduled on the nineteenth. The beginning of morning twilight on 19 February 1945, was at 0549 with sunrise at 0707, and the sun set at 1831 with dark arriving at 1948. Landing ships and craft at East Beach near Mount Suribachi. The Transport Area was about 15,000 yards off the southeastern beaches. The Line of Departure was 4,000 yards from the beach line. The LSM and LST areas were between the Line of Departure and the Transport Area at about 5,500 yards and 8,000 yards, respectively. The weather on 19 February was clear, with a ten-knot trade wind. How Hour was at 0900. The Landing Plan called for putting 9,000 men ashore in the first 45 minutes. The flag signal to "Land the Landing Force" was executed at 0615. At 0805 naval gunfire was lifted and 120 aircraft shot rockets and machine guns and dropped bombs on the beach area and its flanks. Napalm was used generously. At 0825 the early landing waves were in position, and at 0830 the first wave was directed to proceed to the beach. The Pre-Landing Gunfire Support Plan called for putting 8,000 shells on the beach while the troops were moving in from the Line of Departure. Fire was directed at the beach until 0857, when it shifted to the flanks and immediate rear. The first assault wave hit the beach along the 3,000-yard front at almost exactly H-Hour, 0900, and moved ahead rapidly for the first 350 yards under the very real assistance of a rolling barrage of naval gunfire. The second wave was the initial troop wave. The Japanese gun, mortar, and small arms fire against the later waves of amtracs, and against the troops which landed from them was definitely light on the southern beaches until about H plus 30 minutes, by which time many lead vehicles were well off the beach. Japanese gunfire picked up more quickly against the later waves headed for the northern beaches and by 0920 reports of heavy Japanese mortar fire against the right flank beaches were received. met gradually intensifying fire from the quarry and plateau area, from undestroyed pillboxes, and encountered land mines. The tanks were called for, and by noon some reserve units were called in. Since these were embarked in LCVP's and LCMs real problems at the beach line soon developed. The amtracs had had their difficulties with the steep beach and the steep slopes of volcanic sand, but by and large they made it. When it came to the landing craft, the LCVP and the LCM, the amphibians ran into trouble because of the combination of steep beach gradients and the onshore swells. The craft grounded fair and square but the swells broached, then swamped many, before they could be completely unloaded. By nightfall, all assault elements of both divisions had been landed, plus other supporting elements to bring to 30,000 the total of troops landed in one day. The swell, the inshore current, and undertow were the initial hazards for the naval amphibians in the assault phase. But the beaches themselves, and the poor holding ground off the beaches were added problems during the landing of the logistic support. Early in the landing it was decided that Green One was the best beach from both the hydrographic and topographic point of view. Congestion of supplies on beaches due to lack of exits. 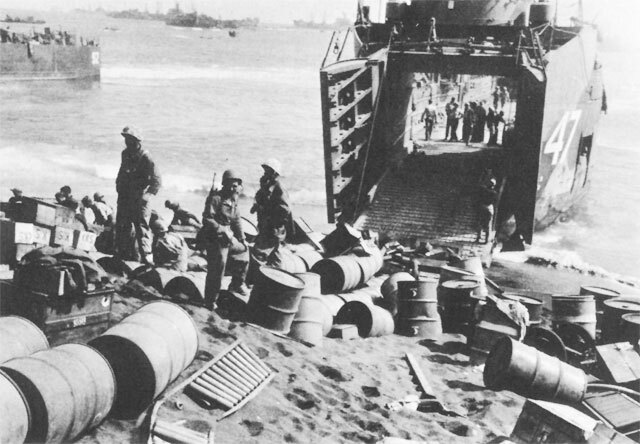 LST-764 unloads at Iwo Jima. Note disabled vehicles. 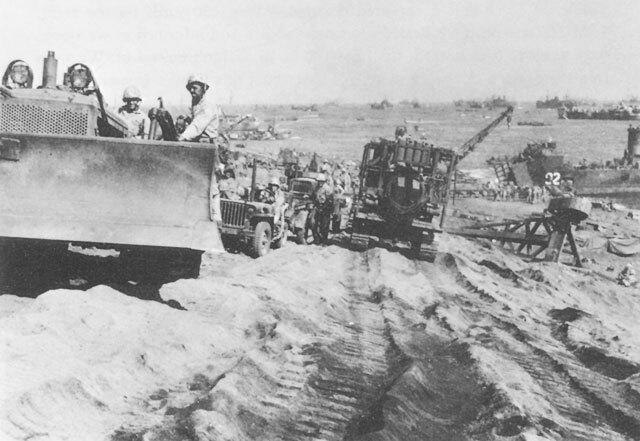 A sand sled able to carry and lay quickly 150 feet of marston matting was developed, and enough small tractors, sleds and matting were obtained to lay eight miles of temporary outlet roads on the Iwo Jima beaches. These were the life savers. After several days of frustration, including a good try at using pontoon causeways, the beaches were closed to all LCMs and LCVP's. LCTs, LSMs, and LSTs were given the exclusive chore of unloading. Even these larger craft, due to the strong winds and heavy swells, were not always successful in preventing broaching. Their primary difficulty was that their stern anchors would not hold in the volcanic ash off the beaches. Barges also proved weak reeds to lean on. The combination of two area air alerts occurring soon after the LSTs were ordered to launch their barges, and the consequent towing alongside in rough water of the recently launched pontoon barges, resulted in drowning out their motors and radio equipment. Nine of the 22 barges suffered casualties to propulsion units in launching. The next four days and nights the surf was bad as was the intermittent artillery and mortar fire. This Japanese fire took a fairly heavy toll of the very limited trained beach party personnel and gave their untrained replacements plenty to worry about. losing 121 landing craft out of 506 carried, despite the limited beaching use of these craft. Very few of the smaller amphibious craft had time or took time to write a report about their problems at Iwo Jima. They were lucky to find time to eat. An exception was the new LST-807, which reached Pearl Harbor in time for the rehearsal. She did the Iwo Jima operation under the command of Lieutenant George D. Straight, U.S. Navy, and as part of T.U. 53.3.9, LST Unit Six. Ship combat loaded with two 2 x 30 causeways, side carried, and 492 tons of 105 and 155 mm artillery ammunition stowed beneath 21 DUKWs on the tank deck. Main deck cargo consisted of 5 amphibious trailers, 1 gasoline tank truck, 1 two and half ton repair truck, 2 Jeeps, barbed wire, water cans, 400 white phosphorus shells, boxes of hand grenades and miscellaneous DUKW maintenance gear. Passenger troops . . . totalled 14 officers and 358 men. 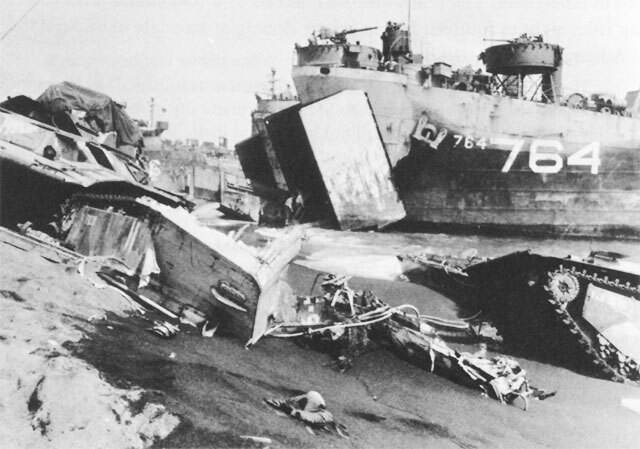 The LST-807 had beaching problems, as did nearly all other landing craft at Iwo Jima.
. . . Spotted FUTATSU Rocks by light of star shells which made landing somewhat easier. 2248: Let go stern anchor, hit beach at 2/3 speed and piled up on top of wrecked vehicles, of which the beach was covered. After hitting the beach, we could just make out a pin point of light which was the beach marker. It is partially hidden by vehicles and is not visible 100 yards in the rain. . . . We beached about 50 feet to left of marker. There was no one visible on beach and it appeared deserted. About 150 yards on our right, LSM-120 was beached. Beachmaster came aboard and informed us we would have to move over towards the LSM-120 or he couldn't unload us. We were told there was a clear spot there. . . . At about this time, a member of our boat crew which was laying to alongside jumped into the water and rescued two men from a foundering DUKW. Another DUKW attempting to leave the beach through the surf and carrying three stretcher cases capsized. . . . They were rescued by the Beachmaster himself and some of his party. When the Beachmaster came aboard again, I told him I did not think it was possible to place the ship in a 50-foot space with this wind, tide and visibility. At this time, 2300, LST-390 beached 100 yards on our right between this ship and the LSM-120, piling up on more wrecked vehicles as we had done. After seeing nothing could be gained by remaining where we were, I decided to retrack and try another beaching in the 50-foot clear space which was now between the LST-390 and the LSM-120. front of our ramp, and that we would have to retract and beach again 10 feet to our right and close up against LSM-120. If this could have been accomplished, it would be considered by this command a modern miracle. Beachmaster was told that we would send a message to anyone he suggested explaining the situation. He then agreed to try moving the wrecked vehicles. While the work was progressing, the LSM-120 on our right retracked from the beach at 0210. We then decided to move over to the spot vacated by her. . . .
Bulldozers reduce the terraces to give access to the lateral roads. The absence of that expertise, the seaman's eye, so much depreciated by the landsmen who have the final authority in the Washington defense establishment, caused damage to far more ships in TF 51 than did the Japanese. Some ships, such as LST-928, were involved in many more than just one collision. The hapless LST-928 established something of a record for a single operation. At Iwo, she traded collisions with the LST-713 (twice), LCT-1269, Fayette (APA-43), Starr (AKA-67), Whiteside (AKA-90), China Victory (XAK), and the LST-764. While maneuvering into position we drifted into APA-93 and scraped our portside on her starboard bow. Thirty-six ships or large landing craft in the Iwo Jima area were involved in collisions or received major damage while alongside another ship during the period 16 February 1945 to 6 March 1945. Another 11 suffered sea damage due to heavy weather. By February 1945, Japanese suicide air attacks in amphibious assault areas were not by any means new. Fortunately at Iwo Jima kamikaze planes were thrown against the Central Pacific amphibians in only one large coordinated attack. This surprise attack of perhaps fifty aircraft, including a fitting share of suicide planes, occurred from 1640 to dusk on 21 February 1945, at a time when the sky was overcast and the ceiling low. in the ships regularly attached to the Joint Expeditionary Force two jeep carriers, the Lunga Point (CVE-94) and the Bismarck Sea (CVE-95), as well as the net tender Keokuk (AKN-4) and the LST-477, were hit by suicide planes. Of these, the Bismarck Sea was sunk by two suicide planes. Loss of life was heavy. The LST-477 fortunately was not carrying a deck load of gasoline, as were most of the LSTs in the formation, so she escaped with the loss of nine men killed and five wounded. The big Saratoga (CV-3) temporarily assigned from Task Group 58.5 to work with the jeep carriers to furnish night fighter patrols in the assault areas, was hit by four or five suicide planes, severely damaged, and forced to retire to the Navy yard. Preassembled Marston matting is laid. All the amphibians, whether on land or sea, and everyone else within sight of Mount Suribachi, received a tremendous lift when the spirited Marines of the 28th Regiment of the Fifth Marine Division raised the American flag on the summit of Mount Suribachi about 1035 on 23 February 1945. Despite this favorable turn (which facilitated the full force of the Fifth Corps being used against the defensive positions to the north), the Japanese "fight unto death" tactics were aided by the rugged volcanic crags, steep defiles, and severe escarpments. The Marine advance was slow, but inexorable. On 9 March 1945, Vice Admiral Turner turned over TF 51 to his Second-in-Command, Rear Admiral Hill, and departed for Guam. This departure, before final victory, was necessary in order to permit concentration on last-minute preparations for the Okinawa operation, for which rehearsals were being held and for which ships would start departing from bases in a few days. Preliminary bombardment at Okinawa was to commence on 20 March 1945, and Kerama Retto, an off-lying island group from Okinawa providing a good anchorage, was to be occupied on 25 March 1945. View from the top of Mount Suribachi. The bad, bad news was that about 4,600 Marines and 800 Navy were killed during the fighting and nearly 20,000 more were wounded, of whom 1,400 died of their wounds. Every one of the lives lost was important to family, to the Navy and the Marine Corps, and to those in command, who landed them, led them in battle, or provided them with their daily bread, butter and bullets. The logistic support at Iwo Jima was a difficult task. 12,600,000 gallons fuel oil--34 fleet oilers employed. This was a mammoth job to do to the satisfaction of the Fifth Fleet. We were taking orders from at least seven commands including the Marine Officer who said he had 'higher authority' than his actual rank. Often these orders were contradictory. In this regard, I can't help but relate just a bit of dialogue heard via voice radio coming from the Marine tanks in battle on shore. The voice calls here used are fictitious. I was in complete sympathy with Casper. Iwo Jima was an epic in the battles of World War II. The difficulty of the task, the efficiency with which the campaign was conducted, and the ardor, the courage, and the skill of the men who "pushed through to the successful conclusion" has drawn high praise from many. But starting with a West Coast newspaper's critical comment regarding the high cost in lives for the success achieved, there has been recurring adverse comment in regard to the pre-landing gun bombardment. So, some of the facts and opinions on this subject will be related. Vice Admiral Turner's Operation Plan (final draft) issued four days earlier than Admiral Spruance's Operation Order had contained this requirement in regards to pre-landing bombardment of Iwo Jima. Both of these final drafts of the Operation Plans were promulgated after there had been much prior correspondence in regards to naval gunfire requirements. The Commanding General, Fifth Amphibious Corps, Major General Harry Schmidt, USMC, in accordance with FTP 167, stated his requirements for naval gunfire on 24 October 1944, and the Commanding General Fleet Marine Forces, U.S. Pacific Fleet had added his comment and approval on 26 October 1944. The arrangements set forth in the basic letter for naval gunfire support are concurred in with the exception of the time allotted for preliminary bombardment. . . . The amount of ammunition allotted appears to be adequate. Allow four days for the preliminary bombardment. This would allow for more deliberate firing. . . . It theoretically would involve no increase in the expenditure of ammunition but rather a slower rate of fire. A Fast Carrier Task Force with a heavy concentration of battleship strength will attack the Empire as a preliminary covering operation, the first strike coinciding with the commencement of the surface ship bombardment of Iwo Jima. . . .
Vice Admiral Turner's letter and Admiral Spruance's reply are reproduced herewith. Vice Admiral Turner's request for naval and air bombardment. Admiral Spruance's reply to Turner two days later. All during October and November, while the gunfire bombardment was being worked up in detail, the requirements of General MacArthur's campaign in the Philippines were having considerable impact upon the gunfire support ships desired at Iwo Jima. When it became apparent that the 16-inch gunned old battleships Colorado and West Virginia would not be available, the new 16-inch gunned battleships North Carolina and Washington from the Fast Carrier Task Forces were substituted initially. They then were withdrawn by Admiral Spruance before the Fast Carrier Task Forces sailed from Pearl and directed to remain with the Fast Carrier Task Forces until Dog Day. four oldest battleships in commission, including one with 12-inch guns, and all built prior to World War I were the ones substituted for the larger gunned old battleships built during and subsequent to World War I. The West Virginia, Colorado, California, Mississippi, and New Mexico were in the Heavy Covering Unit supporting the Lingayen landing. On Dog Day, the new battleships North Carolina (BB-55) and Washington (BB-56), plus the Indianapolis (CA-35) and two light cruisers, the Santa Fe (CL-60) and Biloxi (CL-80), joined the ships listed above as "Finally Available" in the gun bombardment of Iwo Jima. Additionally, that valiant old warrior and fine shooting ship, the West Virginia, was finally sprung from General MacArthur and Lingayen Gulf. After a fast trip from Leyte Gulf to Ulithi and a priority round-the-clock replenishment, she made the 900-mile run to Iwo at 18 knots, earned a "Well Done" from CINCPAC, and by noon had joined the Dog Day bombardment forces. The New Mexico, Mississippi and California all had had bouts with kamikazes at Lingayen and needed Navy yard attention, as did the Colorado, so they could not join in the fray. 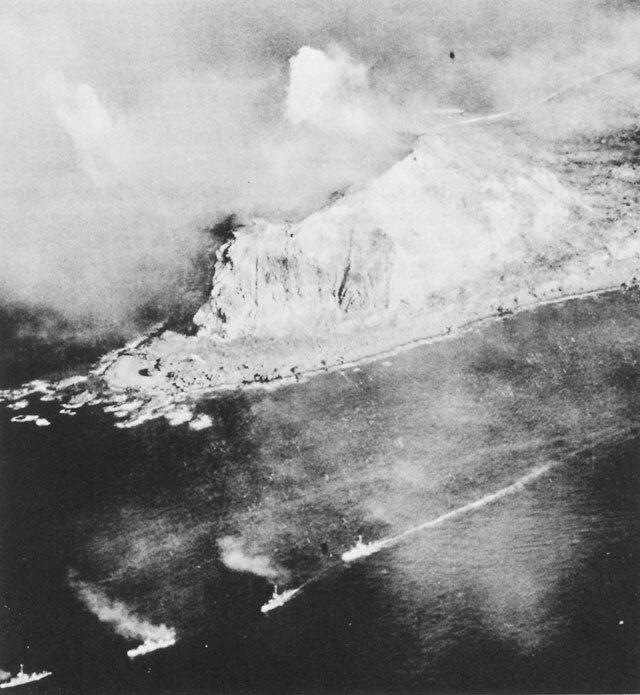 Whether a more complete destruction of Japanese defensive installations might have been accomplished before the landing, has minor relevance in comparison with the fact that pre-landing naval air bombardment and gunfire was adequate: (a) to establish the Marines ashore on Iwo Jima; and (b) in supporting the Marines once ashore so that they could do their intended task, the conquest of Iwo Jima. The point worth discussing is what led the naval commander to deny a cup-running-over of pre-landing gunfire support at Iwo Jima. Despite what has been said elsewhere, a review of the written orders and the letters regarding the pre-landing naval gunfire requirements at Iwo Jima indicate that, from the record, there was unanimity in the hierarchy of the Expeditionary Force as to what should be accomplished in connection with preparing Iwo Jima for the assault landing. There was strong disagreement as to whether the task could or should be accomplished in three or four days. Vice Admiral Turner agreed to change his orders accordingly and undertake the four-day task, if Admiral Spruance would concur. At the next higher and determining level of Fleet Command, Admiral Spruance had the broader chore to balance this pre-landing gunfire requirement of the Landing Force of the Expeditionary Force with the requirement that the whole of the Expeditionary Force did not get clobbered by aircraft flown down from Japan before the Landing Force was established ashore. The one real post-landing offensive flight which the Japanese did fly down, after the Fast Carrier Task Force had swept the great majority of aircraft off the airfields in Central Japan, sank one jeep carrier, sent a large Fleet carrier back to Pearl Harbor for major repairs and damaged another jeep carrier, a large net carrier and an LST. Also, Admiral Spruance had to accomplish the Iwo Jima task without taking his eyes off the Okinawa operations, which already twice postponed was now scheduled to start only six weeks later on 1 April 1945. April 1st was considered a bed rock date. From the seaman's point of view, the lengthy Okinawa operation had to be completed before the typhoon season dropped in on Okinawa shortly after May 1st. Therefore, opening the assault could not be further postponed beyond April 1st. By conducting in mid-February successful air attacks on Japanese aircraft factories in the Empire, and at the same time sweeping off the Empire airfields their reduced ration of operating aircraft, the Japanese would obviously be hampered in their defensive tasks at Okinawa, as well as in the air attacks on the Expeditionary Force at Iwo Jima. The winter rains of 1944-45 stalled the airbase construction on Leyte and on Mindoro in the Central Philippines. To partially fill the gap left by the absence of anticipated land-based air support, a number of jeep carriers of the Pacific Fleet had to be kept available to General MacArthur in Philippine waters. Since many of the same transports and many of the same gunfire support ships, and even, in some cases, the same LSTs and LCI's served the amphibious operations occurring in the Central Pacific Area and in the Southwest Pacific Area, any delay in releasing the ships after an operation in one theater reacted immediately on the operations scheduled in the other. This was happening for Iwo Jima. The delays in General MacArthur's undertaking his Luzon campaign had prevented an early switch of the combatant ships of the Pacific Fleet from that operation to DETACHMENT. It was 27 January 1945, before most of the ships of the Gunfire and Covering Force and the Gunboat Support Force were available at Ulithi to be rearmed and replenished and rest a bit before sailing on 10 February for the Iwo Jima assault rehearsal at Saipan-Tinian. Two of the gun bombardment battleships did not join until arrival at Saipan. As has been noted above, the West Virginia did not join up until Dog Day at Iwo. At the higher levels of naval command it was appreciated, in January 1945, that the Japanese, militarily, had been pushed off balance by a series of United States military victories in the Pacific. It was militarily sound to try to keep the Japanese off balance and moving backwards. The schedule of the Joint Chiefs for the seizure of key points along the way to Japan was a tight one and called for continued use of the air and gun resources of much of the Pacific Fleet. This was the answer about the pre-landing gunfire bombardment in 1945. It is the answer in 1971. And no one knew it better than that gallant Marine, Holland M. Smith. Capture of Iwo Jima was considered essential by those in whose hands the destiny of our nation lies. The cost of winning this objective was no doubt weighed carefully against the importance of having this island as an operating base in speeding the ultimate defeat of Japan. When the capture of an enemy position is necessary in winning a war, it is not within our province to evaluate the cost in money, time, equipment, or, most of all, human lives. We are told what our objective is to be and we prepare to do the job, knowing that all evaluations have been considered by those who give us our orders. As has been stated previously there is a limit to what the naval gun could effectively accomplish. In the opinion of Commander Support Force (Blandy), and of Commander Gunfire and Covering Force (Rodgers), and of the Second-in-Command (Hill), this largely had been accomplished. But this misses the real point, quite completely, which was that while more Marine lives might possibly be lost at Iwo Jima, many more lives of those serving the United States in the far Pacific would be saved by giving the Japanese the one-two punch while they were already off balance. This was done by making low-level attacks on aircraft factories in Japan to reduce the aircraft available at upcoming Okinawa and by sweeping up the Japanese aircraft from the airfields of Japan, so that the Marines could continue to have the active gun and air and logistic support from ship' just offshore at Iwo and Okinawa. A far sounder judgment of the Marine historians was given by Major General Donald M. Weller, USMC, who as a lieutenant colonel at Iwo Jima was Naval Gunfire Officer on the staff of both Lieutenant General Holland M. Smith, and that of Major General Harry Schmidt. 1. RKT to TSW, letter, 13 Mar. 1944. 2. RKT to Rear Admiral R.O. Davis, Commander Amphibious Training Command, letter, 15 Mar. 1944. 3. CTF 51 FORAGER Report, 25 Aug. 1944. 4. RKT to Commandant of the Marine Corps, letter, 21 Dec. 1950. 5. COMPHIBSPAC, COnfidential Circular Letter AL-2--Rev 2, 25 Oct. 1944, subj: Organization of Amphibious Forces, Pacific Fleet. 6. COMPHIBSPAC letters, Ser 000207 of 13 Nov. 1944, and Ser 00016 of 24 Jan. 1945. 7. COMPHIBSPAC to CINCPAC, letter, Ser 000157 of 5 Sep 1944, subj: Reorganization of Transports. 8. Administrative History of Amphibious Forces Pacific Fleet, Vol. 1, p. 130. 10. (a) JCS 287/1, Strategic Plan for the Defeat of Japan, 8 May, 1943; (b) CCS 447, Overall Plan for the Defeat of Japan, 2 Dec. 1943; (c) JCS to CINCSWPA, CM-IN-5137, 12 Mar. 1944 (CINCSWPA's Communication Log); (d) JCS to CINCPOA and CINCSWPA, CM-OUT-50007 of 13 Jun. 1944; (e) CINSOWESPAC 180936 Jun. 1944; (f) CINCPOA 040400 Jul. 1944. 11. King's Record, p. 561. 13. Pacific COnferences, CINCPOA Headquarters, minutes, 13-22 Jul. 1944. 14. (a) MacArthur to Marshall, CM-IN-15058 18 Jun. 1944, and CM-IN-2479, 3 Aug. 1944; (b) JPS 404/5, Future Operations in the Pacific, 23 Jun. 1944. 15. Notes on Conference at Gen. Hq., SWPA, 7 Aug. 1944. Col. William L. Ritchie, AUS, was Deputy Chief of the Strategy and Policy Group, Operations Division, WDGS. 16. 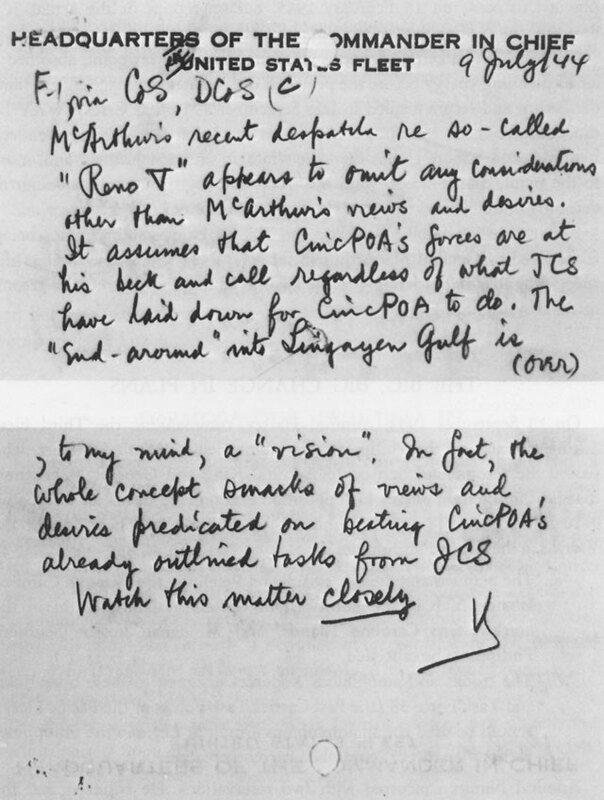 (a) JCS 172nd Meeting, minutes, 5 Sep. 1944; (b) JCS-CM-OUT 27648, 9 Sep. 1944. 17. Hill memo of 17 Nov. 1966. 18. MacArthur, CM-IN-6202, 8 Jul. 1944, Archives Branch of the Federal Records Center, Suitland, Md. 19. Forrestel, Spruance, p. 163. 20. 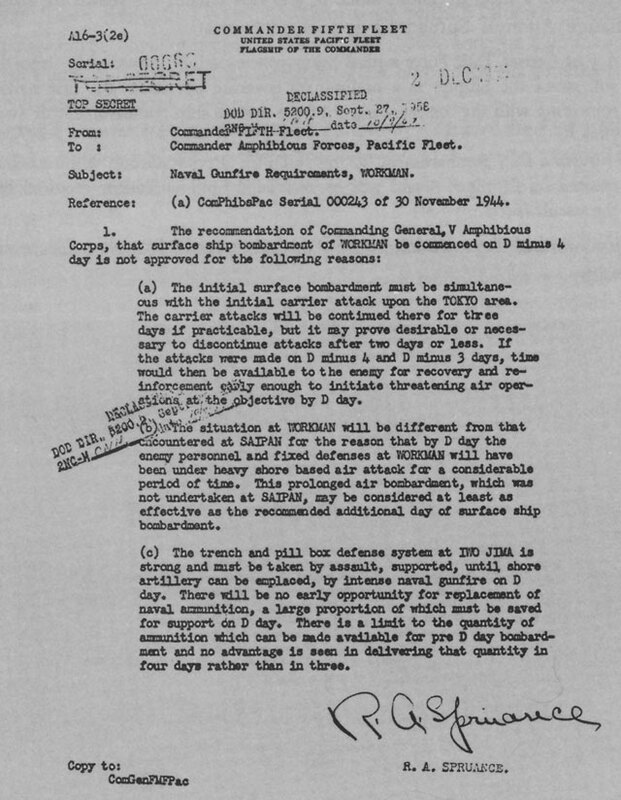 (a) JWPC, Future Operations in the Pacific, 29 July, 1944; (b) JPS 160th Meeting, minutes, 2 Aug. 1944; (c) King to Marshall, memorandum, Ser 002356 of 18 Aug. 1944, subj: Future Operations in the Pacific; (d) JCS Despatch 2405/77500 of 8 Sep. 1944. CM-OUT-27648. 21. Headquarters Tenth Army to CINCPOA, letter, 26 Sep. 1944, subj: Feasibility of CAUSEWAY Operation. 22. (a) COMTHIRDFLT to CINCPOA, 130300 Sep. 1944; (b) CINCPOA 130813, 130747, 132100, 140101, 141000, Sep. 1944; (c) MacArthur to JCS, CM-IN-12636, 14 Sep. and to CINCPOA 140316, 142359 Sep. 1944; (d) JCS to MacArthur in COMINCH, 141325, Sep. 1944. 23. (a) Nimitz; (b) JCS CM-OUT-40782, 3 Oct. 1944; (c) King's Record, p. 575; (d) JCS 032255, Oct. 1944. 24. CINCPAC-CINCPOA Bulletin No. 170-45, Translations. Interrogations No. 35, Item No. B-4726-G.
25. Admiral Spruance to Director of Naval History, letter, 26 Apr. 1966. 26. Administrative History of Amphibious Forces Pacific Fleet, Vol. 1, p. 71. 27. COMPHIBFORPAC to CINCPAC, letter, CAF/A3-1/Ser 00609 of 10 Jun. 1944, subj: Organization of Support Aircraft Command, with endorsements thereon and reply thereto. See also previous letters, Ser 494 of 11 Dec. 1943, and 00139 of 22 Jan. 1944. COMAIRPAC (Vice Admiral J.H. Towers) 8unfaborable endorsement was dated 19 February 1944. COMINCH letter, Ser 001014 of 29 Mar. 1944. COMPHIBSPAC, Circular Letter AL-11-Rev 2, 13 Jul. 1945. 28. Interview with Vice Admiral R.F. Whitehead, 4 Oct. 1961. 29. Pacific Fleet, Administrative Organization Lists, Nov. 1944, Feb.-Oct. 1945. 30. COMPHIBSPAC letter, Ser 1515 of 24 Aug. 1944. 31. CINCPAC 120110 Aug. 1944. 32. COMPHIBSPAC, letters, Ser 00863 of 13 Sep. 1944 and Ser 001032 of 10 Nov. 1944. 33. Administrative History of PHIBSPAC, Vol. 1, p. 134. 34. (a) COMPHIBSPAC, letters, Ser 000213 of 15 Nov. 1944 and Ser 001101 of 9 Dec. 1944; (b) COMINCH Headquarters Memo, no date. 35. CINCPOA to COMINCH< 030215 Dec. 1944 and reply thereto. 36. (a) JCS to MacArthur--Nimitz info Arnold, Stillwell, 032255 Oct. 1944; (b) Outline Plan FARRAGUT 20 Jun. 1944. 37. COMPHIBSPAC Op Plan A25-44, 27 Dec. 1944, Annex B, para. 13. 38. USS Presque Island (APB-44), Action Report, 1 May 1945. 39. (a) CINCPAC Joint Staff Study DETACHMENT, 16 Nov. 1944, p. 38; (b) COMPHIBSPAC Op Plan A25-44, Annex B, para. 14. 40. (a) CINCPAC Joint Staff Study DETACHMENT, p. 7; (b) CINCPAC-CINCPOA Bulleting No. 170-45 7 Jul. 1945, Translations, Interrogations No. 35; (c) CINCPAC-CINCPOA Bulletin No. 2-46, Field Survey of Japanese Defenses of Chichi Jima, 15 Feb. 1946. 41. Whitman S. Bartley, Iwo Jima, Amphibious Epic, U.S. Marine Corps Monograph (Washington: Historical Division, Headquarters U.S. Marine Corps, 1950), Appendix VI. 42. CTF 56 Iwo Jima Action Report, Encl. (C), G-2 Report, Dog Plus Two. 43. (a) CINCPAC-CINCPOA Translation Bulletin No. 170-45, Captured document, Colonel Kaido, Commanding Officer Artillery Group 2nd Mixed Brigade, Inspection Remarks--Iwo Jima, 11 Dec. 1944; (b) Second Lieutenant Kubota, Diary Captured on Iwo Jima. 44. (a) Admiral Nimitz was promoted to Fleet Admiral on 19 December 1944; (b) CINCPOA Op Plan 11-44, 25 Nov. 1944; (c) Commander Fifth Fleet Op Plan 13-44, 31 Dec. 1944. Year dates appearing after names are Naval Academy Class year or year of first commission in the regular Navy. Where no year date and no USNR or USCG, or USCGR, then a temporary officer. Names as given in January 1, 1945 Organization of PACIFIC FLEET, or if not given therein, the 1 May 1945 PACFLEET Confidential NOTICE 3CN-45. LST(H) were those LSTs designated as the first stop off the beaches for emergency handling of the wounded. They were provided with doctors, and essential equipment. Names of Officers in Charge of LCTs could not be located in the Naval Historical Division or the Bureau of Naval Personnel. LCI(L)-425 operated as Flagships for both CTG 53.7 and CTU 53.7.5 in lieu of LCI(L)-722 and LCI(L)-423 previously designated. Where initials of officers do not appear, these were not listed in the written orders, and no report from the ship, craft, or unit could be located, the officer could not be further identified, although considerable effort was spent on this. 46. COMTRANSDIV 45, Action Report, 12 Mar. 1945, para.5. 47. USS Darke (APA-159), Iwo Jima Action Report, 4 Mar. 1945, p. 1. 48. RKT to LED, letter, 3 Feb. 1945. 49. (a) COMPHIBSPAC Training Orders A29-44, 21 Dec. 1944; A30-44, 29 Dec. 1944; (b) VAC DETACHMENT Operation Report, 20 May 1945. 50. LSM-47 Action Report, 9 Mar. 1945, para. 2. 51. Hill Memo of 17 Nov. 1966. 52. Hill Memo of 16 Nov. 1966. 53. COMGEN, Strategic Air Force, POA Report, 9 Dec. 1944, p. 3. See also reports of 10 Dec. and 23 Dec. 1944, and endorsements thereon. 54. CTG 30.2 Action Report for 11-12 November, 19 Nov. 1944. 55. (a) CTG 94.9 Action Report of 8 December, 17 Dec. 1944; (b) Pensacola Action Report for 8 December, 10 Dec. 1944. 56. CTG 94/9 Action Report of Bombardment of Iwo Jima for 24 and 27 December, 9 Jan. 1945, Encl. (C), para. 7. 57. (a) COMFWDAREA CENPAC, Preliminary Report, Ser 00305 of 3 Feb. 1945, p. 1; (b) COMDESRON Four Action Report for 5 January, 9 Jan. 1944, p. 11; (c) CTG 94/9 Action Report for 24 January, 26 Jan. 1945, p. 1. 58. CINCPAC-CINCPOA Monthly Operations Report, Feb. 1945, p. 59. 59. CTG 56 Iwo Jima Report, 1 Apr. 1945, Encl. (C), G-2 Report, p. 4. 60. (a) CINCPAC-CINCPOA Bulletin No. 2-46, 15 Feb. 1946, Item 5: (b) CTF 56, Iwo Jima Report, Encl. (C), p. 9; (c) COMPHIBSPAC (CTF 51) Iwo Jima Report, 19 May 1945, Part V, Section (C). 61. CTF 52 Iwo Jima Report, 22 Feb. 1945, Encl. (D), pp. D-2, -3, -4. 62. CTF 56 Iwo Jima Report, Encl. (C), G-2 Report. 63. (a) CTF 54, Iwo Jima Report, p. 9; (b) CTF 52, Iwo Jima Report, Encl. (C), para 2. 64. CTF 52 to CTU 52.5.1, 171710 Feb. 1945. 65. CTU 52.5.1 to CTF 52, 181352 Feb. 1945. 66. CTF 52 Iwo Jima Report, 22 Feb. 1945, Encl. (C), p. 2. 67. Ibid., Encl. (C), p. 3. 69. CTF 54 Iwo Jima Report, 10 Mar. 1945, p. 12. 70. CTF 52 to CTF 51, 18 Feb. 1945. NCR 60303. 71. CINCPAC-CINCPOA letter, A16/3/FF12, Ser 003975 of 27 Aug. 1945, paras. 96 and 97. 72. COMPHIBSPAC Iwo Jima Report, 19 May 1945, Part II, Section (C), General Account, para. 5, pp. 10-11. 73. COMPHIBSPAC Op Plan A25-44, 27 Dec. 1944, Annex G, Encl. (A), General Instructions for Ship to Shore Movement, para. 4. 74. CTF 56 Iwo Jima Report, Encl. (B), G-3 Report, p. 3. 75. COMGENFIFTHMARDIV Iwo Jima Report, Vol. V, 25 Apr. 1945, Annex George, (RCT 28 Action Report), para. 3a. 76. (a) COMGENFIFTHMARDIV Iwo Jima Report, Vol. 1, 28 Apr. 1945, p. 17; (b) Ibid., Annex How (Naval Gunfire Support), p. 4. 77. (a) CTG 53.2 (COMTRANSRON 15) Action Report, 13 Apr. 1945, Encl. (C), Beachmaster Report, p. 2; (b) CINCPAC-CINCPOA Monthly Operations Report, February 1945, Annex A, pp. 47-48; (c) COMPHIBSPAC Iwo Jima Report, Part II. 78. 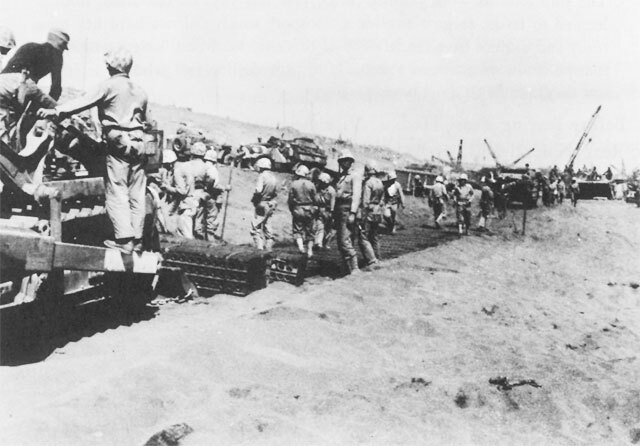 COMTRANSRON 16, Iwo Jima Report, 15 Apr. 1945, p. 17. 79. CINCPAC-CINCPOA Monthly Operations Report, February 1945, p. 48. 80. Hill Memo of 17 Nov. 1966. 81. CTG 53.2 (TRANSRON 15’ Action Report, 13 Apr. 1945. 82. CTG 53.7 Action Report for 19-26 Feb. 1945, no date, p. 11. 83. USS President Jackson (APA-18), Action Report, 17 Mar. 1945, p. 7. 84. USS Agenor Action Report, 1 Apr. 1945, p. 1. 85. CTG 53.7 Action Report, p. 6. 86. CTG 53.2 Action Report, Encl. (C), p. 1. 87. (a) CTG 53.2 Action Report, p. 13; (b) Headquarters 43rd Amphibian Truck Battalion, Action Report, paras. 4 and 5. 88. LST-807 Action Report, 11 Mar. 1945, pp. 1, 3-4. 89. COMPHIBSPAC Iwo Jima Report, Part II, para. 16, p. 13. 90. (a) LST-928 Action Report, 23 Mar. 1945, p. 4; (b) War Diary, 28 Feb. 1945. 91. USS Agenor Action Report, 1 Apr. 1945, p. 2. 92. LSM-47 Action Report, 9 Mar. 1945, Encl. (F), p. 42. 93. RKT to HWH, memorandum, 16 Jan. 1945. 94. (a) LST Flotilla 13 Action Report, 22 Mar. 1945, para. III (7); (b) Saratoga Action Report, 9 Mar. 1945. 95. Domei New Despatch of 23 February 1945, as quoted in Iwo Jima's Press, Vol. III, No. L.
96. HQ 147th Infantry Regiment, Action Report, 11 Jun. 1945, para. 6e. 97. CTU 51.5.1 Iwo Jima Report, 13 Apr. 1945, p. 9. 98. CO LST-760, Iwo Jima Report, 14 Mar. 1945, p. 5. 99. CT 51.5.1 Iwo Jima Report, p. 9. 100. CINCPAC-CINCPOA, Joint Staff Study DETACHMENT, 7 Oct. 1944, Appendix E, p. 31. 101. COMSERVRON Six, Logistic Analysis for DETACHMENT Operation, 8 Mar. 1945. 102. USS Fayette (APA-43) Action Report, 7 Mar. 1945, p. 14. 104. USS Fremont (AKA-44) Action Report, 17 Mar. 1945, p. 9. 105. CTG 51.1 Iwo Jima Report, 25 Mar. 1945, p. 8. 106. Hill memo of 17 Nov. 1966. 107. Commander Logistic Support Force, Logistic Analysis, p. 12. 108. Hill memo of 17 Nov. 1966. 109. COMPHIBSPAC Op Plan A25-44, Annex H, para. 1(h). 110. COMGENFIFTHPHIBCORPS, Action Report, 20 May 1945, G-2 Report. 111. HQ 147th Infantry Regiment, Report of Operations Against the Enemy, 11 Jun. 1945, Encl. 5, Report of Cave Installations. 112. COMFIFTHPHIBFOR GALVANIC Report, Encl. (J), p. 12. 113. CINCPAC-CINCPOA Staff Study DETACHMENT, 7 Oct. 1945, pp. 8-9. 114. COMPHIBSPAC Op Plan A25-44, Annex H, para 1(m). 115. COMFIFTHFLEET Op Plan 13-44, paras. 3(b), 3(c)(4), and Annex B, paras. 2 and 3(a). 116. Headquarters VAC, letter, 24 Oct. 1944; and Headquarters FMF Ser 00080 of 26 Oct. 1944, subj: Naval Gunfire Requirements. 117. (a) COMPHIBFORPAC to COMGENFIFTHPHIBCORPS, letters, Ser 000209 of 15 Nov. 1944; (b) Ser 000199 of 7 Nov. 1944; (c) Ser 02/118/0012A of 24 Nov. 1944. 118. FIFTHPHIBCORPS, letter, Ser 02/118/0012A of 24 Nov. 1944. 119. COMFIFTHFLEET Op Plan, 13-14, Annex B, paras 2(e), e(a). 120. CTF 52 Iwo Jima Report, 22 Feb. 1945, p. 3. 122. Forrestel, Spruance, p. 168. 123. COMINCH P-0012, "Amphibious Operations, Capture of Iwo Jima," p. 1. 124. CTF 56, Iwo Jima Report, p. 2. 125. Smith, Coral and Brass, pp. 246-47. 126. Time Magazine, 12 Mar. 1945. 127. HWH to GCD, memorandum, 18 Jan. 1968. 128. Hon. Mayor Y. Horie, "Explanation of Japanese Defense Plan and Battle of Iwo Jima," 25 Jan. 1946, Appendix, p. i. 129. COMGENFIFTHPHIBCORPS Iwo Jima Report, 20 May 1945, Encl. (A), p. 104. 130. Whitman S. Bartley, Iwo Jima: Amphibious Epic, U.S. Marine Corps Monograph (Washington: Historical Division, Headquarters, U.S. Marine Corps, 1954), p. 202. 131. Donald M. Weller, "Salvo--Splash!," U.S. Naval Institute Proceedings, Vol. 80 (September 1954), p. 1021.